For every young Scottish boy who dreams that one day he might hold the Scottish Cup aloft, there’s two ways he can go about achieving this goal – one difficult and one easy. 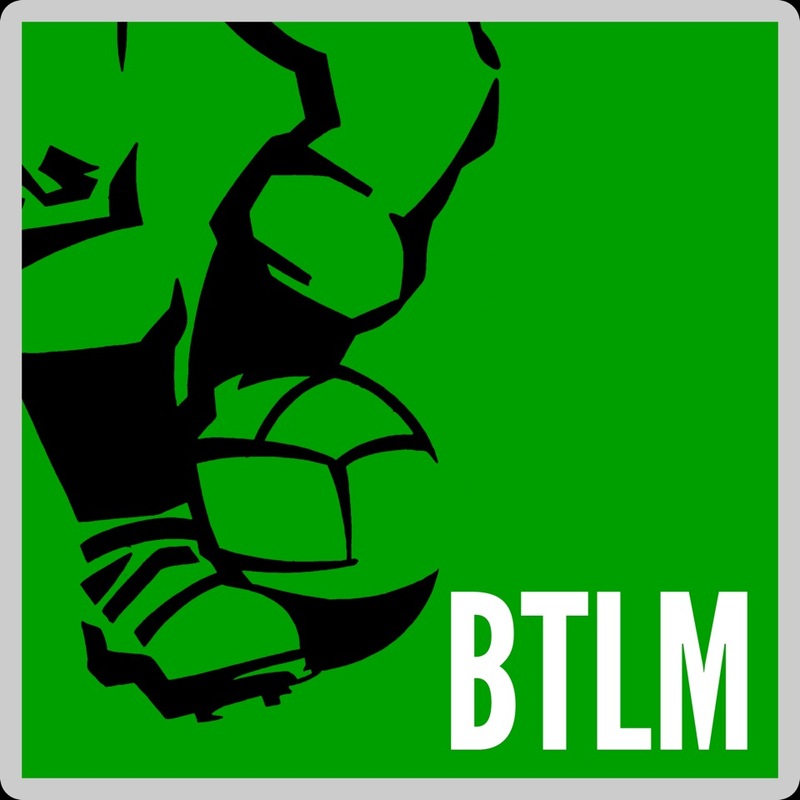 The hard route involves getting very good at football, forging a full-time career with a top professional club and performing at a high and consistent enough level to reach the sharp end of the Scottish game. The easy way involves keeping an eye out for when the SFA drags the Cup along to promotional events in shopping centres, then paying a fiver for a picture of yourself getting your grubby fingers on it for a precious few seconds. So it’s either lifting the Cup to the roared acclaim of a packed Hampden crowd or lifting the Cup to the puzzlement of grandmothers coming out of the nearby Edinburgh Woollen Mills store. The net effect is broadly similar, although the latter route requires you to shut your eyes and use your imagination a bit more. Now I’ve never had the opportunity personally to lay my hands on the Cup in any form, but I can claim a familial connection to someone who did; indeed someone who in his lifetime developed a wholly unique relationship with the famous trophy. Not only did my late grandfather lift the Scottish Cup (in a non-football setting), but it’s because of him that the oldest national football trophy in the world still exists at all. Early on the morning of Saturday 6th February 1971 fire broke out in the Main Stand of a deserted Pittodrie Stadium, home to Aberdeen FC. The alarm was quickly raised and within the hour a crew of 35 firemen wearing breathing apparatus was on the scene battling to get the blaze under control. 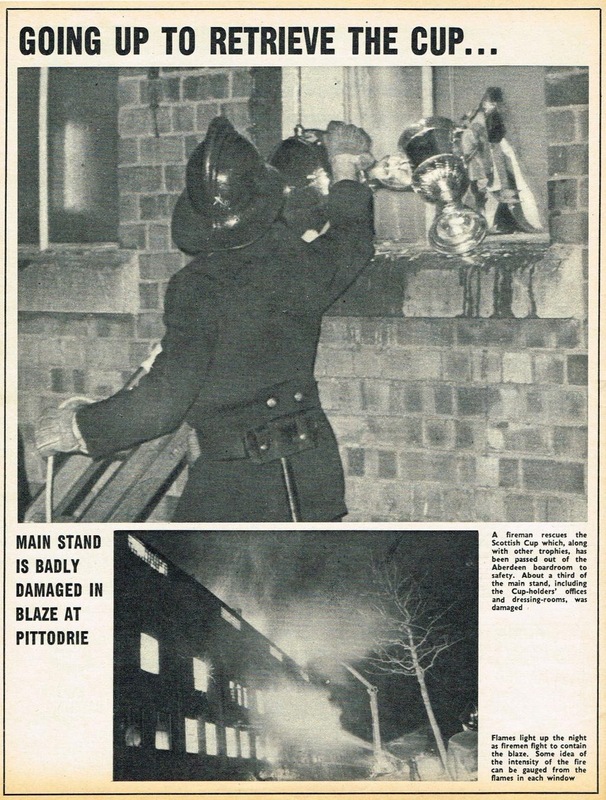 With a third of the stand alight the club secretary, Bert Whyte, appealed to John Donnachie (the Grampian Fire Master and my late grandfather) who was directing operations to save the Scottish Cup that Aberdeen had won the previous season and was residing, increasingly precariously, in the smoke-filled boardroom. My grandfather had attended many games at the ground so knew the layout well. He directed his crew to break a couple of windows on Pittodrie Street and sent in two men on this special rescue mission. The pair felt their way through the smoke to the glass cabinets and passed out the Scottish Cup and several other club trophies that were close at hand. Fortunately no-one was hurt in the blaze that was later blamed on a discarded cigarette smouldering for some time under the Main Stand before catching alight, but there was plenty of collateral damage for the club with the loss of offices, dressing rooms and all the team shirts and training kit. Sadder still was the destruction of a substantial collection of club memorabilia and records dating back to Aberdeen’s formation in 1903. But the priceless Scottish Cup that had been first presented to the captain of Queen’s Park in 1874 was safe at least. With the huge blaze having been finally extinguished after many hours, an exhausted group of grimy firemen stood in an empty Pittodrie office. The early hour and the dangers they had faced were forgotten as, led by my grandfather, each took it in turn to hoist the Scottish Cup aloft like excited schoolboys, imagining the office’s drab ceiling tiles were the blue, blue skies of Hampden on a late spring afternoon. My grandfather used to speak about his fondest football memory coming during the war. Selected to play for Hamilton Accies in a friendly game, not long before kick-off he was thrilled to discover that a certain Stanley Mathews had arrived unannounced and would be guesting as a teammate. Saving the Scottish Cup came a very close second to playing alongside one of his heroes and the actions of him and his men ensured he too would always be thought of as a hero in the city where he made his home and career. A holder of the Queens Fire Service Medal, John Donnachie continued as Grampian Region Firemaster until his retiral in 1977. There was one last encounter with the famous old trophy in store for him in 1991 when a local newspaper wrote an article to commemorate the twentieth anniversary of the fire. For the piece the journalist brought together at Pittodrie for the first time in many years my grandfather and the two firemen under his command who had entered the Pittodrie boardroom that February morning in 1971. 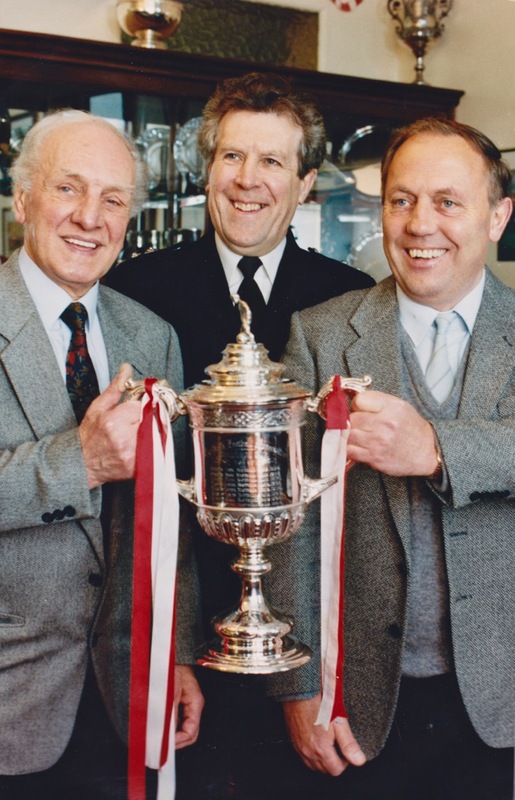 Aberdeen were the holders of the Scottish Cup in 1991 as in 1971, so the trio had the opportunity to hold the famous old trophy once again, and this time in much happier circumstances. Wasn’t aware of this. Great write up and some great images to go with it!